These little bunnies are the cutest and perfect for two little girls! Thankyou! This stuffed Easter bunny is a special treat for the little ones. It’s a super soft, cuddly friend that will brighten up any Easter basket. 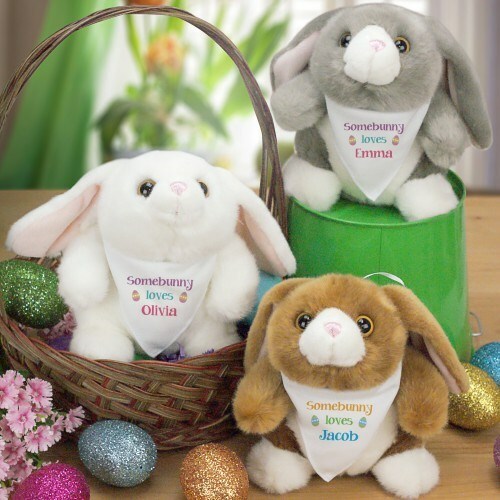 Our bunnies wear a bandana designed with festive Easter eggs and comes in your choice of either blue/green or pink/purple and may be personalized with any name up to 10 characters. Our 9” bunnies offer high-end plush fabric and have plump little bodies and floppy ears. They have big lock washer brown eyes and a pink stitched nose. Each one of these bunnies will make an instant best friend to you little boy or girl. We will also include free gift wrapping and a free personal message to help make it a wonderful occasion! We ordered the white bunny with a girls bandana, just precious. Additional Details Check out other personalized stuffed animals for her and sweet romantic stuffed animals too!